The following articles are taken from the archives of 'The Scotsman'. Click on any images to view full size. Craigleith Quarry is among the many interesting scenes to be witnessed in the environs of this City. Its vast extent and depth and beauty of its freestone, the great number of workmen in active employment and the geological phenomena all have a tendency to attract visitors. An object worth seeing in the Quarry is a huge block of stone dislodged by the power of the wedge. The stone was 65 feet in length by 24 in breadth and 7 feet 9 inches in thickness and weighs about 1000 tons. This stone was for Mr Forrest, Calton Hill, the talented and indefatigable sculptor. Blasting rock on a large scale was tried out in Craigleith Quarry for the first time in May last. The bore was 7 1/2 inches in diameter and worked to a depth of 27 feet. It was charged with 224lbs of gunpowder. On the powder being fired there was a tremendous concussion took place. The explosion cause a massive fissure five to ten feet wide and fifty feet deep and that 8-10 thousand tons of stone was dislodged from the solid rock. 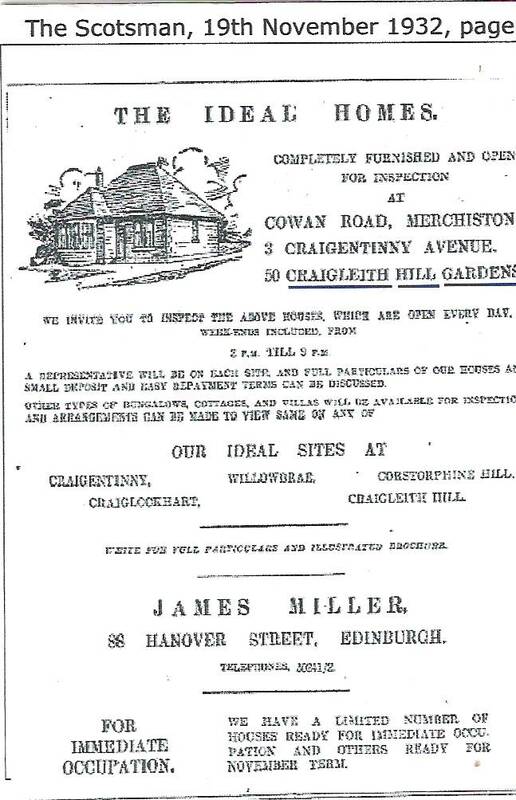 Another experimental blast at Craigleith Quarry was planned for 15th October. Charging to commence at 2pm and will light the match at 3pm. The quantity of powder to be 500lbs of best double strong blasting powder. To defray the expense.. cards of Admission priced One Shilling each were put on sale the previous day. We understand that his Grace the Duke of Buccleuch has accepted an offer of Mr Johnstone of Craigleith Quarry for building the new pier at Granton. Granton Harbour:- A railway for conveying stones from Craigleith Quarry to be used in the erection of Granton Harbour is now completed. GRANTON HARBOUR The pier which constitutes one portion of this work, makes progress. The mound of rubble stone, which forms its interior, is now advanced about 200 feet into the sea. The Duke has opened a sandstone quarry, situated very commodiously for his purpose, on the beach about half a mile westward, from which the stones are conveyed to the pier by a temporary railway. Large squared blocks of Craigleith sandstone are shipped for London at a point about 100 yards westward of the pier: and this has lead probably to the mis-statement, that the stones for Granton harbour came from that quarry. 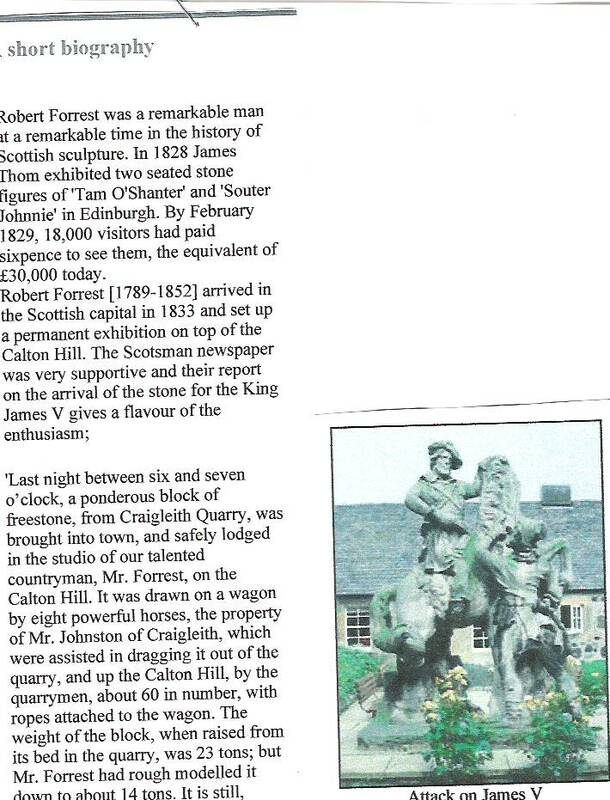 Mr Johnstone of Craigleith Quarry was asked to send specimens of Craigleith dressed stone to the Great Exhibition. Mr Johnstone was requested by scientific friends to put them on display before sending them to Crystal Palace. 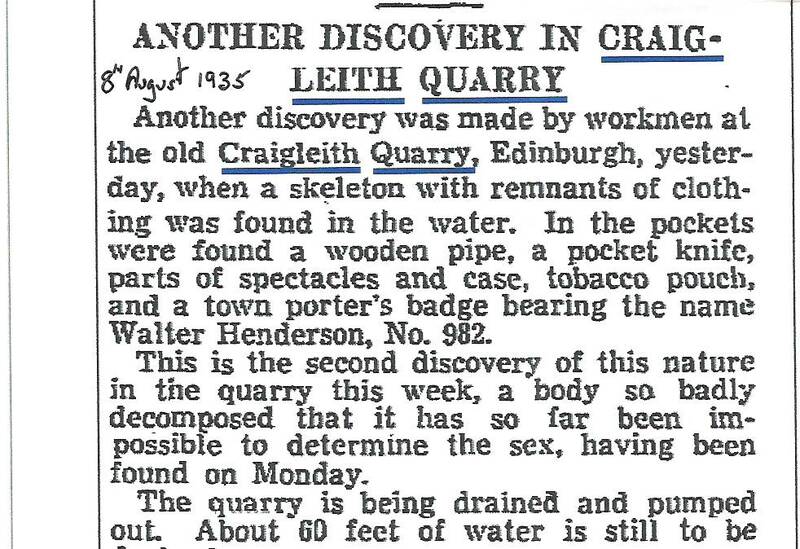 They were displayed in a wooden booth at Craigleith Quarry. Admission was sixpence for the benefit of men hurt in the quarries. On Monday afternoon the stackyard of Mr Johnston, farmer at Craigleith Hill took fire and before the progress of the flames could be arrested, two stacks of grain were entirely destroyed. At the Burgh Court Mr John Tod Craigleith Hill House was charged with contravening the slaughter houses Act in having within his premises at Craigleith Hill House, which is within a mile beyond the police bounds of the City ,slaughtered, or caused to be slaughtered 140 sheep. Mr Tod pleaded guilty committing the act in ignorance not aware his premises were within the distance specified in the Act. Report of Royal Society meeting. Papers read commented on two new fossil trees found in the Quarry. 'In 1826 the first tree in the quarry was uncovered 130 feet from the surface. It measured 36 feet in length and 3 feet in diameter and was a pine. The one described by Mr Witham was found in 1830 and ten feet of its length is preserved in Botanic Gardens and another eighteen feet in front of the Museum of Science and Art. In 1831 a fragment of a third fossil was found. In 1854 another fragment was brought to light. In the same year a portion of the large tree was exposed to sight but was again covered over by debris. Lately at a depth of 123 feet from the level of the roadway there had been exposed twenty three feet of this great tree and the total girth could not be less than ten feet'. Quite recently another fossil has been exposed 186 feet down with a diameter of two feet 10 inches. Leaves of Cyclopteris found in the lower carboniferous sandstone found in Craigleith Quarry. House for sale in Barnton Terrace Upset prices £1200 (south end of Craigleith Road) and 9 building plots for sale at the west end of Craigleith Road or originally West Barnton Terrace. BIRTHS To Mrs Thomson of Ramsay Cottage Craigleith a daughter. The grass parks of Barnton, Drylaw, and Craigleithhill will be let for the season. A careful man appointed to look after the stock. Proposed adoption of the road act of 1878. In aid of the maintenance of the suburban roads. The number of carts from Craigleith Quarry was estimated by the clerk to be 50-60 a day through the first tolls round the city for the year 1875-76. On Tuesday 8th Noveember 1887 at 12 o'clock sale by Auction of Quarry Plant belonging to the Trust Estate of the deceased T.S. Hunter Esq. and sold owing to expiry of lease. Items include steam cranes, special steam pumps and boilers. Earth waggons,bogies, Barrows, Picks ,Hammers, wedges ,Mattocks Chains, stone shears, Pinch bars, Smithy tools Horse Harness Carts Lorries etc etc. Cleaning and Lighting Committee - Since the commencement of the railway strike quantities of city refuse had been laid down at Craigleith Quarry but due to insufficient supply of railway waggons no more than a third of the refuse was being removed. As such all depositing of refuse was to stop. The committee were unable to find an alternative site. Town Council meeting. Erection of destructors. Authorising the purchase of four sites for the erection of refuse destructors. Discussion took place on the suitability of Craigleith Quarry. 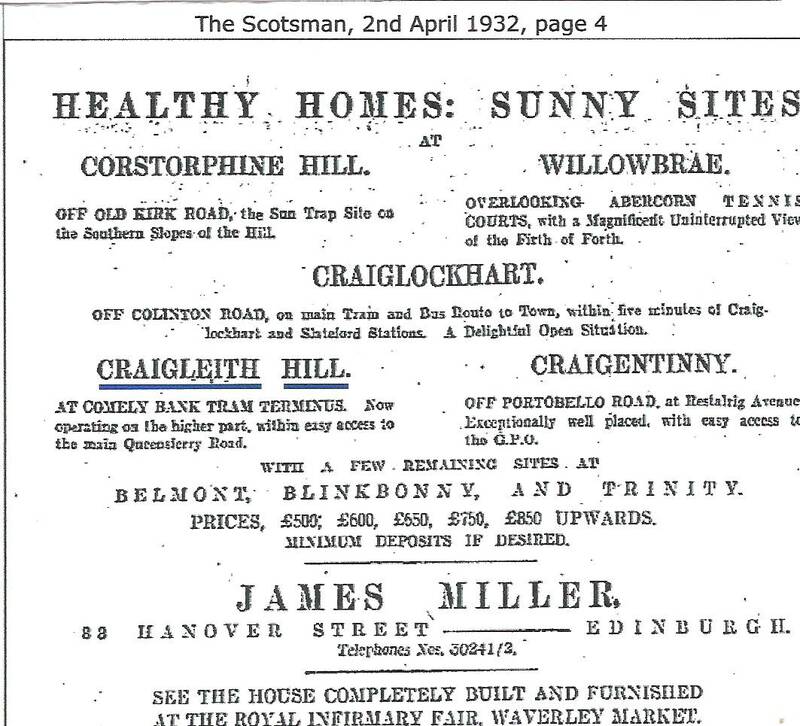 Comments included that Craigleith Quarry would have plenty outlet for "clinker" and in a hundred years hence it might make a fine public park. (This was followed by laughter). Little did this Cllr know that he was close...it became a Retail Park The quarry was exhausted and was capable of taking all the City refuse for 50 years. City population at this time was 330,000. There were only a few houses in the City within a mile radius of the Quarry. In the section - 'FARMS WANTED AND TO LET': Craigleith Hill House with Coachman's House, Byre, Stables and Offices and the Fields adjoining, extending to 19-208 Acres in the Parish of St. Cuthberts as presently occupied by Mr Thomas Watson, Dairyman. Hugh Campbell received £100 , from the owner of Craigleith quarry Sir James Ramsay Gibson Maitland Bart of Barnton, for damages for injuries sustained by him having fallen into Craigleith Quarry. Broken metal for concrete work can now be supplied in any quantity by cart or rail. Apply Craigleith Quarry. Fatal Accident at Craigleith Quarry. Joseph Masterton a labourer was so severely crushed by a large piece of rock falling upon him that he died soon after the occurence.The deceased along with other labourers were involved in blasting operations. Housekeeper (working) wanted immediately, where girl kept, age 40 to 50. Good home for really trustworthy person. Apply Miss Cowper Craigleith Hill House. Edinburgh Highland Show Mr Joseph Hastie Craigleith Hill House exhibited two pigs at the top of the over 16 and under 24 stone class which came second in the PEN of TWO PIgs. Joseph Hastie Craigleith Hill House again won the Pen of Two Pigs Large white and large black at the Highland Show. Do you recognise the area? Villas and bungalows Edinburgh Dean of Guild Court yesterday granted warrants to James Miller to erect 22 house in Craigleith Hill Gardens. The house will be of the type of bungalows and semi-detached villas already built in these areas. Sub committee of the Streets and Buildings Committee of Edinburgh Town Council yesterday agreed to recommend that Craigleith Quarry be used as a dumping ground for city refuse. It is estimated that the quarry would provide a refuse dumping ground for at least ten years. The Irish Free State draw for the Cesarewitch closed at Dublin yesterday when £150,000 was distributed in £100b cash prizes. One of the winners was "RAB" from Craigleith Hill House, Craigleith. 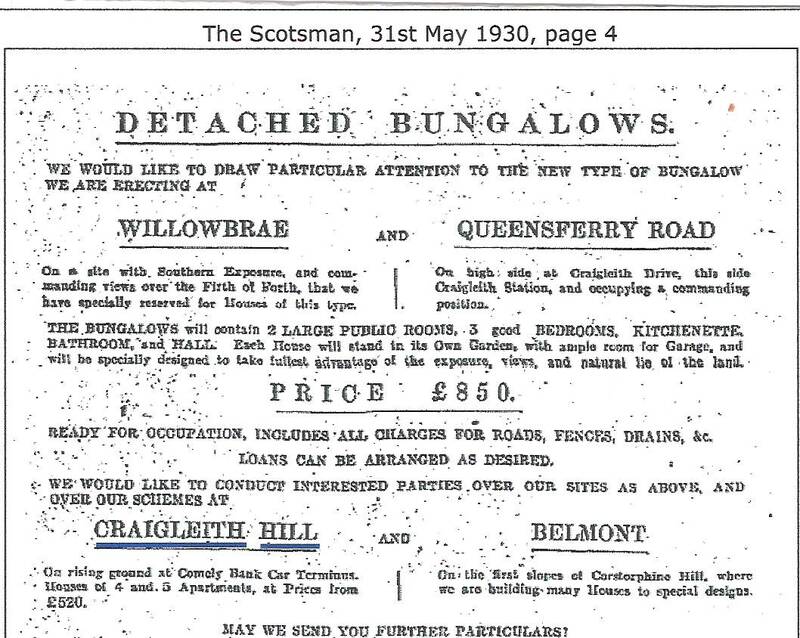 Edinburgh Dean of Guild Court sanctioned building warrants to James Miller for a Shop and dwelling house at corner of Craigleith Hill Avenue and Craigleith Hill Crescent. Examples of Craigleith stone as well as cast stone were shown by the lessees of Craigleith Quarry John and James Lawrence, Ltd Quarrymasters.The cast stone was manufactured from aggrtegate of crushed Craigleith stone produced direct from the quarry just yards away from their workshops. Refuse collections will start in Craigleithhill Avenue,Green,Crescent,Grove,Gardens and Loan on Monday and Thursday commencing at 12 noon.